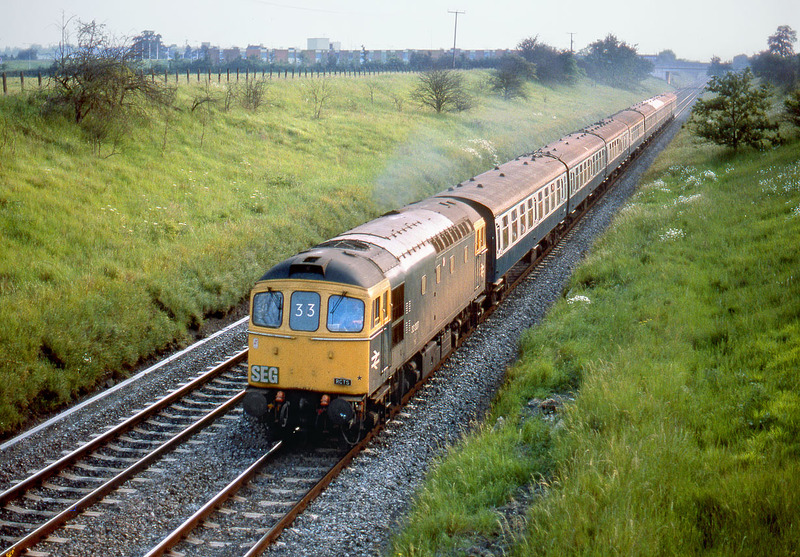 With just a very faint trace of evening sunlight remaining, 33207 passes South Marston (near Swindon) with the SEG / RCTS 1Z27 'Birmingham Boomerang' railtour on 16 June 1984. Starting from Waterloo at 08:00 this tour had visited Birmingham (naturally! ), Shrewsbury, Llanwern, and Avonmouth before being pictured here en-route back to the capital. Although the buildings on the edge of Swindon can just be seen in the background, the relentless expansion of that town has resulted in this view having changing considerably since 1984. The field on the left is now occupied by a large retail park, while on the right a siding diverges into the Honda car plant.